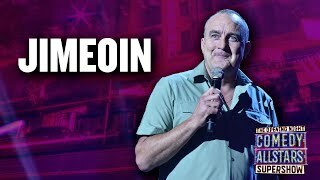 Jimeoin was born in Leamington Spa, Warwickshire, and grew up in Portstewart, Northern Ireland, but moved to Australia at the age of 22. He lives in Melbourne, but frequently returns to the UK. His first TV appearance down under was on the stand-up show The Big Gig in 1991, and he subsequently landed a regular role on the sketch show Full Frontal. In 1994, ghe starred in two series of his own, eponymous comedy series for the Seven network. Other Australian TV credits include Rove, Thank God You're Here, Spicks and Specks and Good News Week - while in the UK he appeared on Michael McIntyre's Comedy Roadshow in 2010 and Comedy Rocks with Jason Manford in 2011. A combined travelogue and stand-up show he filmed across the north of Australia was shown on both BBC Northern Ireland in 2008 and Australia's Comedy Channel in 2010. We do not currently hold contact details for Jimeoin's agent. If you are a comic or agent wanting your details to appear on Chortle, click here.